Team LightArrow is excited about the new updates of LifeTopix 8.2, My.Agenda 3.2, Pro.Inbox 1.2, and Pro.Calendar 1.1. Our new updates include several new features to maximize your productivity at home, work and while you’re on the go. Keep reading to learn how you can take advantage of the latest features. Note: The Pro.Inbox update will be available soon. 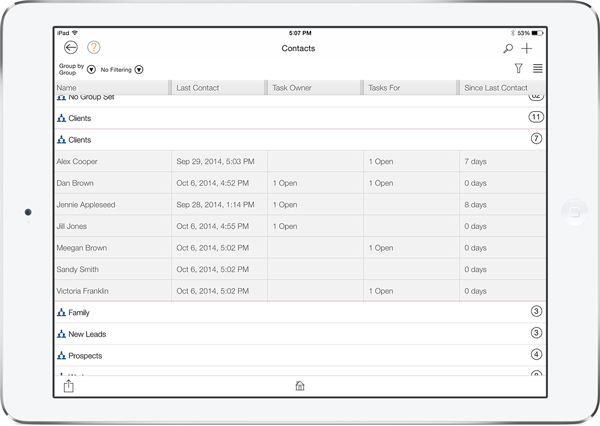 LightArrow apps are updated to work with iOS 8 and the new larger iPhone screen sizes. The calendar views are now more readable with clearer views and better text sizing. The following options are now available in My Settings to provide you with more flexibility and default behaviors. You’re now able to change the text size to Small, Regular, Large, and Extra Large. You can accomplish this by going to the Font Size selection in My Settings as shown below. Examples of the new choices are shown below (Small, Regular, Large, and Extra Large). Your Hot List contains your “Favorites.” It displays your most commonly used categories and items allowing you to quickly access them. Using the Hot List saves you time in navigating to frequently used items or categories. For example, if you created a Log Form for logging activities related to Triathlon training, you could add this form directly to the Hot List so you can quickly access it every time you complete a new training item, such as a run, biking session, or swimming session. You can access the Hot List from the left navigational pane of the main view by tapping Hot List. There is now an option in My Settings that allows you to choose whether or not completed items are automatically hidden from showing in the Hot List as shown in the example below. An example of Descending Transactions is shown below. An example of Ascending Transactions is shown below. In My Settings, you can now choose a dark or light background for graphs that are available in the Health + Goals topic. This option is shown below. Examples of the dark and light themes for graphs are shown below. For tasks, there are different methods for creation of repeat schedules. You can create all the tasks at once or you can ask the app to only create the following task in a series when the previous task is completed or cancelled. Now, you can set the default behavior in My Settings by using the choices shown in the example below. In the Bookmarks + Lockers topic, you are now allowed to add up to 12 text-based items to a locker. Previously, the maximum number was seven. In the Finances topic, you are now allowed to add photo(s) to a payment. This allows you to take photos of receipts, invoices or other supporting information associated with a payment. You can accomplish this by accessing the payment and tapping Add Photos at the bottom of the Payment view and adding a photo, as shown below. In the Health + Goals topic, date ranges are now available when viewing graph data from activities, etc. You can view data from the last week, last 30 days, last 60 days, last 90 days, or last year. An example is shown below. 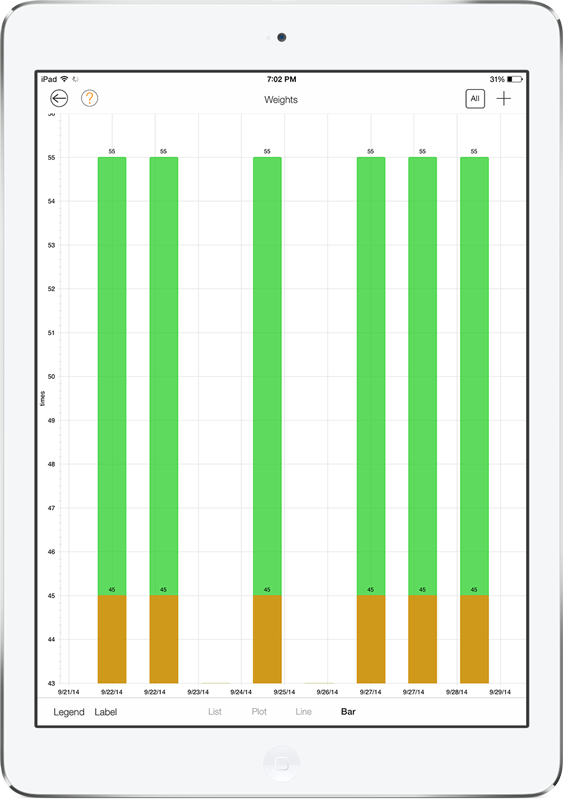 In addition, labels for multi-metric graphs now show labels on the Y-axis for forms that contain items with the same types of units. The new labels are shown in the example below. You can now share checklists via text message with items included in the text message up to 140 characters. Simply choose the checklist you wish to share, then tap Share and select Text Message as shown below. The text message appears as shown below. You can now create custom local notification sets for items such as social events, meetings, and other items you wish to remember. This way, you can set several notifications for items at specified intervals to help you remember. Custom Notification sets are available for Projects, Tasks, Appointments, Trips, Visits, Events, and Reminders. To create a reminder set, access the item for which you wish to create a reminder set; tap the iOS Calendar tile, and then select Custom Notification Sets as shown below. The Custom iOS Notification Sets screen appears (as shown below), which allows you to create custom notification sets. Simply tap the plus sign to get started. In the New Notification Set view, tap the plus sign to create a notification set. From the New Notification Criteria list, you can select three criteria for the alerts, which include a number; minutes, hours or days; and before or after (the item). An example is shown below. After you save the reminder sets and the item for which you wish to add the items, you must add the reminder set to the item. Add the set by tapping the iOS Calendar tile for an appointment or other item, and then tap Manage iOS Notifications as shown below. If you’ve purchased the Pro Contacts Pack, you can enjoy the following enhancements. In the People + Services topic, you can now create contact logs for your contacts to keep track of when and how you contacted them. Simply open a contact record in your LightArrow app, and you’ll see a new section called, “Contact Log” as shown in the following example. To add items to the Contact Log, Simply tap the new section shown in the image above to access the Contact Log for the contact. There are several options available in this section. The Quick Log, shown below, allows you to quickly add a date and time (as the current time). This includes choices for email, text, Facebook, Twitter, and phone calls. The call log also includes the ability to add free-form text, audio, video, photos, and drawings. You can also reorder the items by tapping the Reorder icon in the top-right section. In addition, you modify the text and journal time of any Quick Log that you create by tapping it. In the People + Services topic, you can now add a list of people to contact directly from your list of contacts (similar to a checklist). To begin, simply tap the Call Lists tile in the People + Services topic, as shown below. When the Call Lists view appears, tap the plus sign. The following view appears allowing you to select contacts you wish to call, email or text. In addition, you can contact them directly from your Call List. The Grid view (Spreadsheet-Like view) for contacts now provides additional information for contacts including Last Contact (date and time of last contacted); Task Owner (number of open tasks); Tasks For (number of open tasks); and Since Last Contact (computed number of days since last contacted). To see this new information, tap the Filter icon at the top left of the grid view and then switch the slider to ON for the options shown below (with the blue slider set to Show). 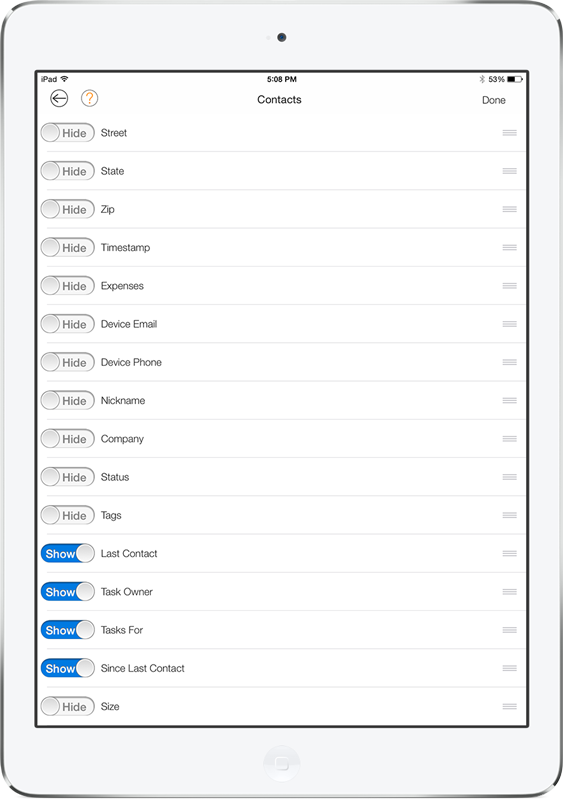 The options in the following section are very useful when you’re managing sales leads, clients and other types of contacts with your LightArrow app. You can now filter on the number of days since you last contacted someone in your list by setting a filter. To create the new filter, access the Contacts view, choose the Filter drop down, and tap New Filter as shown below. Next, add a title and comment for the filter, and then tap the New Criteria button in the New Filter view. Choose an Attribute from the list such as “Last Contact”; choose an operator such as Equals, Not Equals, Less Than, Greater Than or Contains; and then choose a value (such as the number of days). An example of a filter for number of days exceeding 5 for last contact date/time is shown below. Once you select this filter in the Contacts view, you can easily locate clients, potential clients, or other contacts that you have not contacted in a specified period of time. An example is shown below. A new free pack is now available for improved project and task management. The following sections describe the new features. You can now create a task hierarchy for project tasks or other items in your LightArrow app. You can only work with task hierarchies within a project or other item that supports tasks. To create a task hierarchy, access or create tasks for a project or other items that support tasks. To get started, choose Group by Hierarchy as shown in the following example (at the left side of the view). After the Tasks view is displayed and the view is grouped by “hierarchy,” tap Arrange Hierarchy at the right side of the view. Next, tap a task and choose Add New Item as a Peer or Add New Item as Child to create a new peer or child item. These options are shown below. After you create your tasks, you may wish to re-arrange them. To do so, access to the group of tasks via the project or other item. Tap and hold a task. You can move the task by dropping it, or you can choose Make Peer or Make Child as shown in the following example. It is now possible to convert Tasks to Projects, Trips, Visitors and Events. Simply access the task through the Projects + Tasks topic, then tap Convert. Select one of the choices (as shown below) and complete the conversion. This deletes the task and creates a new project, trip, visitor or event – depending upon the selection. This conversion is only available for non-recurring, single tasks. It is now possible to convert Appointments to Projects, Trips, Visitors and Events. Simply access the appointment through the Events + Appointments topic, then tap Convert. Select one of the choices (as shown below) and complete the conversion. This deletes the appointment and creates a new project, trip, visitor or event – depending upon the selection. This conversion is only available for non-recurring, single appointments. In the Notes + Files topic or from the Agenda view, you can create checklists/to-do lists with mixed types of items, which are referred to as “Pro Checklists.” Previously, these lists only included text-based, plain lists items. Now, you can add appointments, reminders, activities, nutrition items, health stats, medication, and wellness entries to Pro Checklists. The Pro Checklist items are automatically added to your agenda. To get started, open a checklist or create a new checklist. Next, tap Convert to Pro Checklist, as shown below. Once you tap Convert to Pro Checklist, the following selections become available. A Pro Checklist can contain plain items, tasks, appointments, activities, medication, nutrition items, reminders and shopping items as shown in the example below. The Event View now allows you to contact invitees and co-hosts via call, text or email directly from the Event view. To take advantage of this new feature, go to an Event in the Events + Appointments topic. You will notice a section in this view with buttons for calls, text messages, and email (as shown below). Tapping these buttons allows you to automatically contact the invitees and co-hosts of the event that you planned. For email, an email is created that includes all of the invitees and co-hosts as recipients. For text and phone calls, a list of invitees and co-hosts is displayed, which allows you to contact each person individually. We hope you enjoy the new features! Please comment and let us know if you have any questions or comments about your LightArrow app. i create a recurring appointment and enter a phone number in the comments section. How do I get the comments to carry over into all the recurring appointments. It seems that I have to enter the same info into each individual appointment. The comments only register in the initial appointment and not the recurring ones. Thank you for reaching out to us! We will take your suggestion in to consideration for a future release. One way to achieve similar functionality is to associate your recurring appointments to a ServiceProvider or a contact (if you have the Pro Contacts pack), after making sure that you have a contact (with a phone number) associated with that ServiceProvider. Should you have further questions or comments or suggestions, do not hesitate to contact us again.